Frisco, NC, was called Trent by its first English settlers. Today, Frisco is a small village without a lot of visible historic landmarks, but the history of the area dates back to the Hatteras Native Americans, and some refer to part of this island as Indiantown. At the western edge of the Buxton Woods Maritime Forest, this area is believed to be the border of the Hatteras natives’ living area. A great shell midden, or oyster shell and trash repository, was found here at Brigand’s Bay (formerly known as King’s Point). The midden, which is said to be several football fields long, led some archaeologists to believe that as many as 5,000 natives once lived on the island. Frisco, NC, used to have three large sand hills, called Stowe’s Hills, as a landmark. Later, the dominant feature of the landscape was a big hill called Creed’s Hill. A life-saving station was established at Creed’s Hill in 1879. Longtime residents say they remember the woods in and around Trent being extremely thick and that delicious wild grapes grew on vines in the woods. The post office was established at Trent in 1898, but for some reason the postal service changed the name to Frisco, NC. It is believed that Trent was too close in spelling to the Trenton post office on the mainland. While the current-day town is predominantly residential, it does offer two distinct Frisco, NC, attractions – the Billy Mitchell Airstrip (named after the world-renowned Navy airman) and the Frisco Native American Museum. Air traffic isn’t exactly steady here, but if you happen to own your own plane, you can get a perspective of just how skinny this strip of land known as Hatteras Island is. The museum tells the story of the thriving Native American culture that called this island home long before we did. It's sometimes surprising the number of things to do in Frisco, NC – at least in the summertime! Off season, it's gets pretty quiet around here. But from Memorial Day to Labor Day, you can take yoga classes, get a massage, go to art classes, attend live music and jam sessions, spend an afternoon playing mini-golf and go-carting, take a tour of Hatteras Island in an air-conditioned bus with commentary by a long-time local or even ride a horse on the beach. Of course, all that's on top of spending time on the uncrowded beaches, maybe kayaking or kiteboarding on the sound and relaxing in a chair reading a book. Since your fur babies are welcomed on all Frisco beaches as long as they're on a leash, you can also take a long walk (but do note that the sand in the summer can get very hot, so beware your pet's paws). As far as Frisco, NC, shopping goes, the most popular draw is galleries – there are lots of really good ones, but you’ll also find tackle stores, gift shops that feature jewelry, home accessories, bath and body products and more and several shops that tempt you with all kinds of fudge and other sweets. You can also buy hand-built deck furniture (they ship! ), recycled goods and – of course! – the latest in bathing suits and casual clothing. If you want to stay here, your Frisco, NC, "hotel" options are actually three campgrounds, all very popular in summer, so plan way ahead. A nice aspect of Frisco campgrounds is that they're on wooded lots, providing some much-appreciated shade in the hot summer months. Each has its own calling card: There's a marina at one of them, one is oceanfront and the third has all kinds of amenities such as a store, fish cleaning station, pool and full hookups. Interestingly, the Frisco, NC, restaurant scene sort of shines! One of the longest-established Outer Banks seafood restaurants (40 years and going strong!) is here as well as a pizza shop that doubles as a bakery that has welcomed guests for decades. Additions are a great raw bar and grill where you can get everything from local seafood to burgers to frog legs and a fantastic sandwich shop that serves delicious hand-cut fries as well as BBQ. Liquor by the drink is allowed in Frisco, but you should call ahead to make sure the restaurant of your choice serves mixed drinks. The wait time in summer at these restaurants is not a major factor. Where is Frisco, NC, located on the Outer Banks? Frisco is south of Avon, NC, and north of Buxton (where the Hatteras Island Lighthouse is). But, because there is no open area between Frisco and Buxton, it's very hard for visitors to know when they've left one town and entered the next. Suffice it to say that if you're beside the lighthouse, you're in Buxton. From Oregon Inlet, where you come over the Bonner bridge and enter Hatteras Island, it's about an hour drive to Frisco . . . and a beautiful drive at that with wide open beaches on one side and the marsh on the other. The only development on this island is found within the town seven small borders; otherwise, it's undeveloped, wide beach. That's hard to find anymore! Are you allowed to drive on the beach in Frisco, NC? Yes, you may access the beach at off-road vehicle ramps that are located throughout Hatteras Island, but be sure to get a permit before doing so. Permit offices are at Bodie Island (north of Oregon Inlet) and at the Hatteras Island Visitor Center. Don't drive on the beach without a permit, or you might get a hefty ticket. And be very aware of the ramps and beach sections that close off seasonally due to turtle or bird nestings. Are there lifeguards in Frisco, NC? There are no lifeguards on the beaches of Frisco, NC. The closest one is a 10-minute drive north at the Hatteras Island Lighthouse beach. Those guards are on the stand from 9 in the morning until 5 in the afternoon, Memorial Day to Labor Day. If you swim in Frisco, you must be extra careful. Always swim with a buddy, take a flotation device out on the beach with you, keep a hawk's eye on your kids and learn how to spot a rip current! 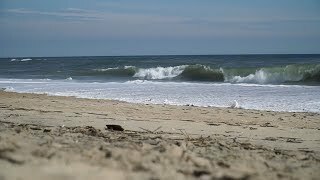 Where are the public beach accesses in Frisco, NC? If you're not renting one of the many vacation rental houses in the area, the majority of which are either oceanfront or oceanside, there are several options for getting onto the beach. 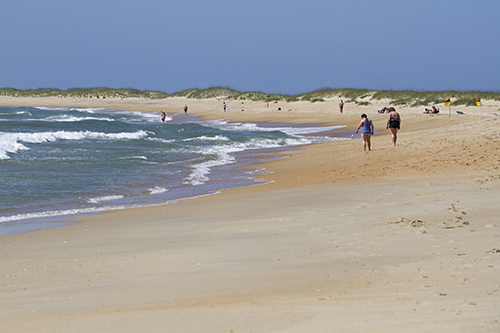 One is that you purchase a beach driving permit for the time you're here (see above) and drive your 4WD onto the beach via Off-Road Vehicle ramps that are located throughout Hatteras Island and are clearly marked. Note we say your 4WD vehicle – nothing else! Another option is to use these ramps as your walkway to the beach. Still another is to find some hard-packed sand on the side of N.C. Highway 12 (the main road that runs through the island) and walk over the dunes. We all know that we need to be super careful in how we treat the dunes here since they're the only barrier between ocean and road during storms. But usually you can see a well-trod path and chose to use that one. A word of caution, though: Make sure the sand is hard-packed where you want to pull off. One good sign of that is that there will be other cars parked in the area. But we locals see countless cars spinning helplessly in the sand all the time, and while it's often the case that a super nice kid in a big pickup truck will stop and offer to pull you out, if that doesn't happen, the fee from the tow truck isn't something you particularly want to pay. What are the Frisco, NC, vacation rental houses like? Frisco's vacation rental options are more varied than on other parts of the island. Canalfront homes are popular here, and many vacationers like this quieter choice, especially if they want to bring their own boat and dock it at the house. These vacation rentals are in more residential neighborhoods, so the experience is closer to living in Frisco than just vacationing there. That said, of course there are many oceanside and oceanfront rentals that range from simple, older, smaller homes to newer, large ones with lots of extras that can accommodate a couple of families. You can choose based on your budget and whether or not all 20 of your cousins are tagging along! How far away are other attractions from Frisco, NC?